Another sad bit of breaking news on this busy Wednesday morning. 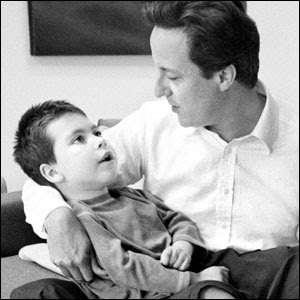 Ivan Cameron, aged only 6, has passed away as a result of Ohtahara Syndrome (often confused with cerebral palsy). He was the son of opposition Tory leader, David Cameron. Here the poor lad is being cradled most lovingly by his dad. My deepest condolences to the Camerons. Losing a child, any child, is unimaginable. I hope there is no media circus about this, or any child of a notable personality. The Lasting Tribute website has updated its memorial pages to include young Ivan Cameron. It's a respectful memorial to Ivan and somewhere to pay tribute to the family's fortitude at this difficult time. As a father of a child with many of the characteristics of Ivan, I just can't phantom losing her. My daughter has given me an amount of strength I never knew I had but at this moment I feel devastated for their loss. Wow, Jorge, I remembered something of the sort, but your words made incredibly sentimental towards you. Hugs...what more can one say? Can't imagine anything worse. God love them.